Mission-critical board-to-board connector applications demand fail-safe signal integrity as well as rugged and reliable harsh-environment performance. 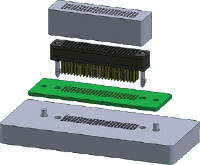 The HD Stacker™ brings Glenair innovation to stacking board-to-board connectors with several significant design improvements: Ultra high-density .0625" Chevron Contact System provides 55% more contacts per connector size, or a 31% size reduction for the same number of contacts as compared to current industry solutions. Polarized connector bodies and available polarized guide pins prevent accidental mismating. The solder-free press-fit compliant pin contacts are removable, repairable, and available in custom lengths. HD Stacker™ connectors may also be ordered with pre-wired cable or flex jumper terminations. Highspeed signal integrity test reports are available on the Glenair website. 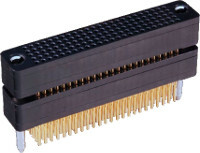 Choose HD Stacker™ for the ultimate in high-density, rugged board-to-board stackable connector performance.